After securing their position as leaders in the world's high-speed train markets, Chinese train makers are now eyeing the urban transit manufacturing sector－pushing more low-cost, smart mass transportation models at home and abroad, competing with rivals in Germany, Canada and Japan. 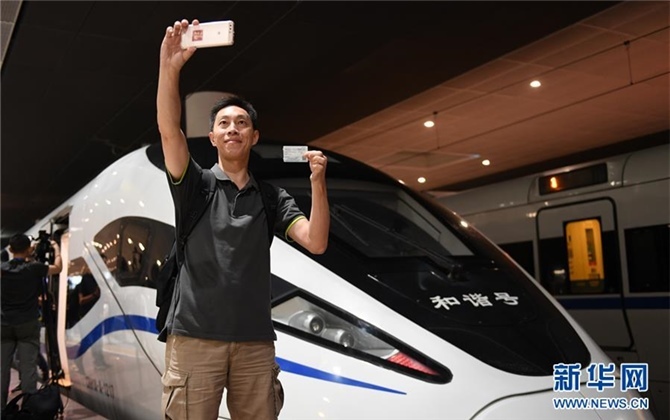 In June, CRRC Zhuzhou Locomotive Co, a subsidiary of China Railway Rolling Stock Corp, developed a "smart bus"－the Autonomous Rail Rapid Transit, or ART, which is about 30 meters long and equipped with sensors that can read the dimensions of roads and plan its route. It has a maximum speed of 70 kilometers per hour. It is the world's first driverless rapid bus and was tested in Zhuzhou of Central China's Hunan province on Oct 23. The smart self-driving electric vehicle runs on a virtual rail system. ART was developed by a research arm of CRRC Zhuzhou, which also produces key parts for the country's high-speed trains. It comes with three or five carriages, which can carry up to 100 people per carriage. A three-carriage bus is scheduled to be put into regular service starting next year. The vehicle can run for 25 kilometers after a 10-minute charge and has successfully undergone 24 hours of nonstop road testing. It currently travels on a 3.1-km test line with four stops between the city's Shennong Theater and a sports center, while a 9-km route is being planned linking the current route to form a loop. "In China's urbanization drive, there is huge demand for urban transit systems with more intelligent elements," said Feng Jianghua, chief engineer of CRRC Zhuzhou Institute Co, one of CRRC Zhuzhou's research and development arms. "Since the vehicle runs without rail, it only takes one year to build and put into operation, making it much more cost-effective than tram cars," said Feng, adding that the cost to build one km of standard ART is only one-fifth of that for traditional tram systems, which cost 150 million yuan ($22.6 million) to 200 million yuan per km. "Most small-and medium-sized cities cannot afford expensive subway systems, or the systems take too long to build," he said. China Railway Signal and Communication Co, one of the country's railway control systems providers, also launched its first low-floor tram in October. The 32.5-m long train can move at a speed of 70 km per hour and carry up to 370 passengers. For low-floor trams, the distance between the carriage floor and the rail ranges from 30 to 35 centimeters. Station platforms are not needed, making the trams more accessible for children, disabled people and the elderly. The tram can be powered by an installed lithium battery and super capacitor, therefore making the traditional cable system unnecessary. Also in October, a hybrid electric tram powered by hydrogen fuel cells was put into commercial operation in Tangshan, North China's Hebei province. Produced by CRRC Tangshan Co, another CRRC subsidiary, it is the first commercial hydrogen-powered tram in the world. "Only water will be emitted from the tram, making it completely environmentally friendly," said Li Ming, manager of CRRC Tangshan's technology development department. "The tram emits no pollutants and the heat produced by the hydrogen fuel cells can be used for internal heating in winter," Li said. The tram can be refilled with hydrogen in 15 minutes, which can power the tram to run 40 km. Traveling at a maximum speed of 70 km per hour, the train has 66 passenger seats and can hold up to 336 people.